Gas Metal Arc Welding (GMAW) is characterized by the creation of sparks and spatter ejecting from the workpiece as the weld wire/filament shorts and melts over 100 times per second. The creation of spatter is an inevitable part of the GMAW process but it presents a number of issues for the production process, including damaging functional surfaces, increased consumables, and poor finish aesthetics. It may not be possible to eliminate spatter altogether, but it can be greatly reduced with a better understanding of why spatter is created and how to tune your process parameters to control it. Spatter is the discharge of high temperature material as a result of melt pool surface tension and the conversion of thermal energy to kinetic energy. This sprays small droplets of molten metal onto the surrounding area where they cool and solidify creating a non-uniform surface finish. It is well known that different GMAW processes produce varying levels of spatter but even spray GMAW, which is known for spatter control, can greatly benefit from spatter reduction. As well as being a nuisance to clean, spatter can be a costly problem for GMAW welding. A case study performed by Welding Answers  looked at the benefits of parameter tuning and found that spatter reduction by as much as 85% was possible through better parameter settings, leading to operating cost reductions of 21%. This was achieved through reduced labour costs, less lost filler material and fewer consumables required to post-process the weld. In order to reduce the total spatter, a strong understanding of welding parameters and their effect on the weld pool is required. According to the ASME, 77% of welding defects including high spatter content are caused by improper processing conditions or operator error . Most commonly, adjusting the amperage, voltage, and distance of electrode to workpiece are the significant factors influencing spatter production. Other factors that influence spatter include wire-feed speed, electrode thickness, and surface contamination. 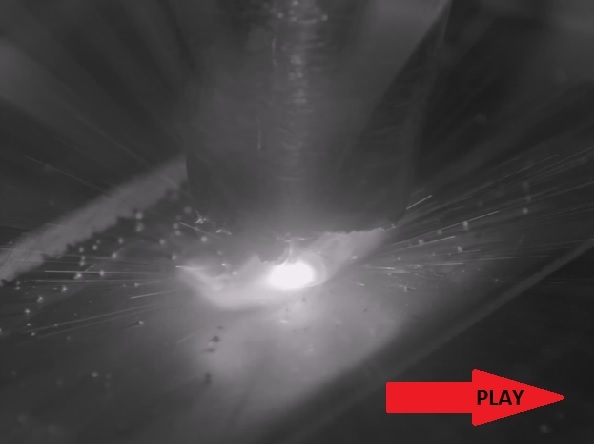 With the use of a Xiris High Dynamic Range welding camera, the weld arc, spatter ejection, and surrounding material can all be clearly observed and the amount of spatter created during the welding process can be monitored and evaluated. This allows better understanding of the effects of varying the welding parameters and their influence on spatter formation. With a clear view of the operating field, welding parameters for every material and thickness can be adjusted to reduce spatter content and inefficiencies as a result of spatter production and cleaning can be greatly reduced. Shielding gas is the inert or semi-inert gas that is pumped into a welding process to protect the weld area from atmospheric gases such as oxygen, nitrogen, and water vapor that could reduce the quality of the weld or make the welding more difficult. The wrong selection of a Shielding Gas can lead to a porous, cracked, or weakened weld, as well as increase the amount of weld spatter. The better Shielding Gases, however, can improve the weld bead shape and weld bead penetration, while reducing the amount of fumes generated. By monitoring the look and appearance of a Shielding Gas, a welding operator can select a Shielding Gas that dramatically increases the welding speed, quality, and deposition rate of a welding process. Traditionally, a method of monitoring Shielding Gas has been to listen to the arc to hear the crackle of the weld process. This was never an exact process, as the best way to monitor shielding gas is with visual means. 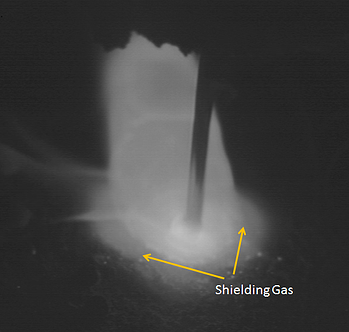 Small, subtle changes in the chemistry of the Shielding Gas can make significant changes to the weld process. The chemistry affects the variations in arc and weld bead characteristics, which in turn have dramatic impact on the resulting weld. Very different weld outcomes are generated depending on whether a mixture of Argon with CO2, Argon with O2, or a tri-mix of Argon\CO2\O2 is used as the shielding gas. For example, using a shielding gas rich in Argon with a small amount of Oxygen and CO2 (i.e., between 2% and 8%) works well in GMAW Spray and Short Circuit transfer modes, where the welding can be performed at lower voltages than if an Argon/CO2 mixture was used. Mixtures rich in Helium (>50%) with small concentrations of Argon and CO2 establish a stable weld arc with good cleaning in GMAW Short Circuit transfer mode. When using Argon-rich (>50%) shielding gas for GMAW Spray transfer mode, the addition of CO2 increases weld penetration, while adding helium improves wetting and flattens the bead profile. Using a Weld Camera and a remote display console to visually monitor the impact of gas mixtures, while also monitoring the wire type and wire feeding characteristics, greatly improves the ability for the operator to monitor and adjust the parameters for optimum performance. The Weld Camera adds the ability to see the detail of the arc and monitor the impact of the shielding gases in real time, to determine the optimum welding procedure for your particular situation. The speed, weld penetration, arc configuration and weld spatter characteristics are all visible to the operator using a Weld Camera, so that the operator—at a safe, remote distance looking at the display monitor—can determine how well the shielding gas is performing. Gas Metal Arc Welding (GMAW)—also known as Metal Inert Gas (MIG) welding or Metal Active Gas (MAG) welding—is a semi-automatic or automatic arc welding process in which a wire electrode and shielding gas are fed through a welding head. The process is quite hostile to any camera in or around the welding process. As such, for a successful application of a Weld Camera for remote monitoring of GMAW, the camera needs to be designed to meet harsh environmental conditions—including high heat, extreme variations in arc light intensity, weld smoke, and metal spatter. But that’s just the starting point. A Weld Camera must not only be industrially hardened to suit the tough environment conditions; it must produce weld images with enough clarity and detail to provide operators useful guidance for making in-process adjustments. 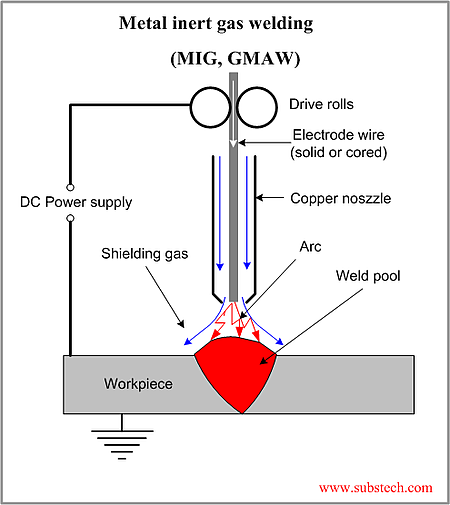 The GMAW welding process takes place by means of constantly supplying a consumable metal electrode in the form of a wire and shielding the arc with some sort of gas, as shown below. The GMAW process has three transfer main modes—spray, short circuit, and globular. Spray mode is where a stable electric arc passes metal from the electrode to the work piece. It’s a cleaner process than other modes and easier to image, as the arc has a fairly consistent intensity. Globular transfer is the most undesirable mode as it generates high heat, poor weld quality, and plenty of spatter. In globular transfer, balls of molten metal build up on the end of the electrode and eventually drop on to the work piece, causing a large weld pool, uneven surfaces, and huge variations of arc brightness. Short Circuit uses lower current than Globular, providing less heat input, but is a similar process, in which balls of molten metal form on the electrode and bridge the gap between the electrode and the work piece, causing a short circuit that extinguishes the arc, which is quickly reignited when the ball of molten metal disconnects from the electrode tip. The result is that the arc is constantly being short-circuited, extinguished and reignited causing extreme fluctuations in brightness. In GMAW, achieving the necessary image quality can be a significant challenge. GMAW is the most common and readily available metal joining process—preferred for its versatility, speed and the relative ease of adapting the process to automation—but from an arc-monitoring point of view, it’s the most difficult welding process to monitor. This difficulty arises because GMAW normally involves huge changes of brightness—ranging from an almost-dark scene between pulses of a weld arc to the full-on blasts of a short-circuited arc’s pulses of light, which last for variable durations and have a large range of brightness variation due to high-speed modulation. While some welding processes may have an arc that appears constant to the human eye, the pulsing arcs in short circuit GMAW may appear vastly different in recorded videos, as most cameras acquire images at rates of 25-50 Hz. If the GMAW process is modulated at a similar speed, some images acquired could show a completely dark arc. Adding to the complexity of GMAW remote monitoring, the GMAW process can vary significantly from one application to the next depending on the arc parameters (e.g., current value, type of modulation, pulse duration, and wire supply speed). These remote monitoring challenges contribute to two prevalent quality problems in GMAW: dross (solid impurities in the weld) and porosity (air pockets or voids formed in the weld material as it solidifies), both of which lead to poor-quality welds. Detect the presence of dross in the weld pool that could lead to poor welds after cooling. Identify porosity in the weld bead that could reveal a potential for reduced weld strength. Confirm that the surface of the molten pool and the immediate surrounding parent metal is kept clean of impurities. Verify alignment of the weld head and filler material to the seam. Monitor the smoke to determine if any changes to the welding metallurgy or shielding gas are occurring. Confirm the size and shape of the shielding gas to ensure correct placement around the arc to isolate the weld from ambient contamination. 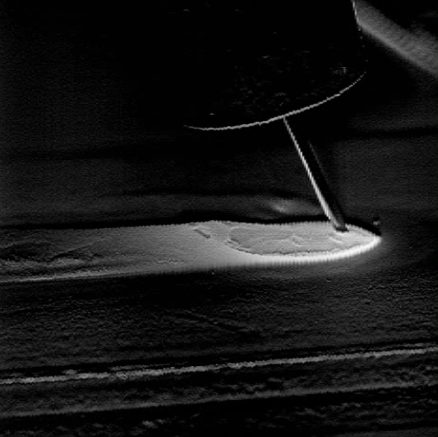 GMAW presents remote imaging challenges—wide brightness variations, harsh camera conditions, varied processes—that require a Weld Camera with sufficient dynamic range to produce high-quality images, versatility for use in multiple types of GMAW, and a design that can withstand the welding environment.